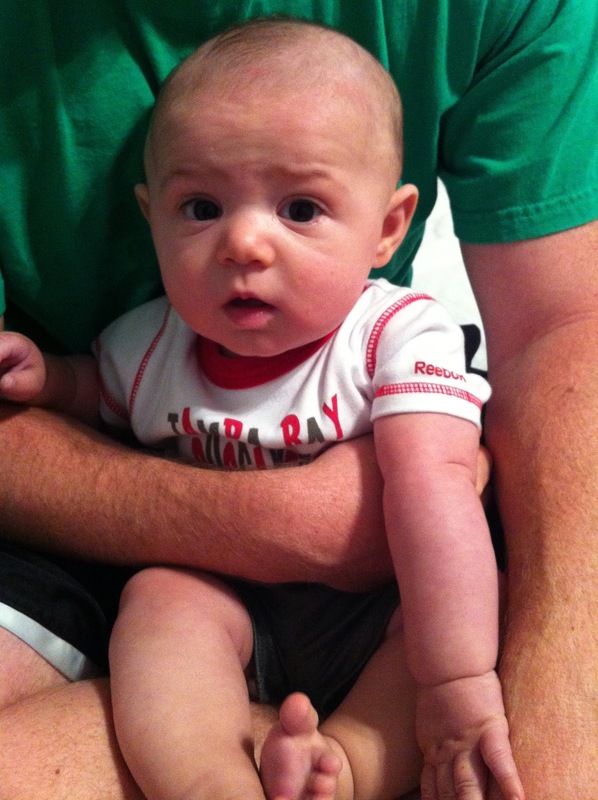 On Sunday Mason turned 4 months old. We took him to the doctor's office on Friday for his 4 month vaccinations and Dr. E couldn't say more positive things about Mason. He still has a slight flat spot on the back of his head but the Dr. isn't too worried about it correcting itself once Mason is off of his head more often. He sleeps on his tummy during naps but still sleeps on his back for most of the night. Although now that he is rolling over I find him on his stomach once in awhile when I go into his nursery for a feeding. Mason is still having one feeding through the night but for the most part is sleeping a long time (or what I consider to be a long time). He usually goes to bed around 7:30pm or 8:00pm, wakes up for a feeding around 2:00-3:00am, then wakes up for his day around 6:30-7:00am. During the day he eats every 2.5-3.5 hours. We are still using the swaddle to get him to sleep through the night ... although we've moved onto having one arm out at the beginning of the night. 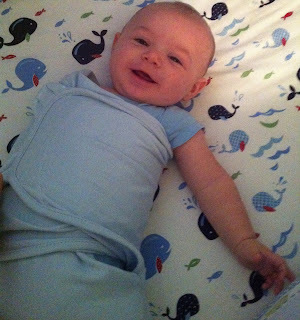 I'm scared of putting him to bed without the swaddle completely since that would most likely mean a whole lot of crying and zero sleeping for both of us. He still loves playing on his activity mat, although it is usually on his stomach and no longer on his back swatting at the hanging toys. He's almost tall enough for his jumperoo and loves bouncing up and down in there. He doesn't really like the Bumbo ... probably because his legs get stuck since he's so chubby. He's still loving the stroller and going on runs with mommy and daddy (mostly mom). He's gearing up for his first flight so hopefully that goes without any issues. 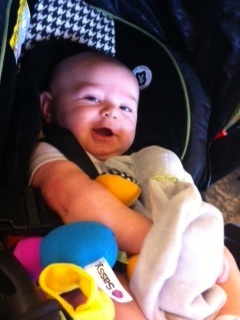 Thankfully traveling with Mason (from a 10 minute drive to a 4 hour drive) hasn't been a problem. We started on rice cereal, once in the morning and once at night, but are still struggling with it. It's only been a couple of days so hopefully he'll begin to love it, or at least tolerate it. Other than that it's been another great month of having our little monster around. He's growing so fast and starting to really show his huge personality. He's babbling and making noises so hopefully his first word (mama) will be here soon. No teeth yet ... but still showing all of the signs of teething so maybe one will pop in soon. 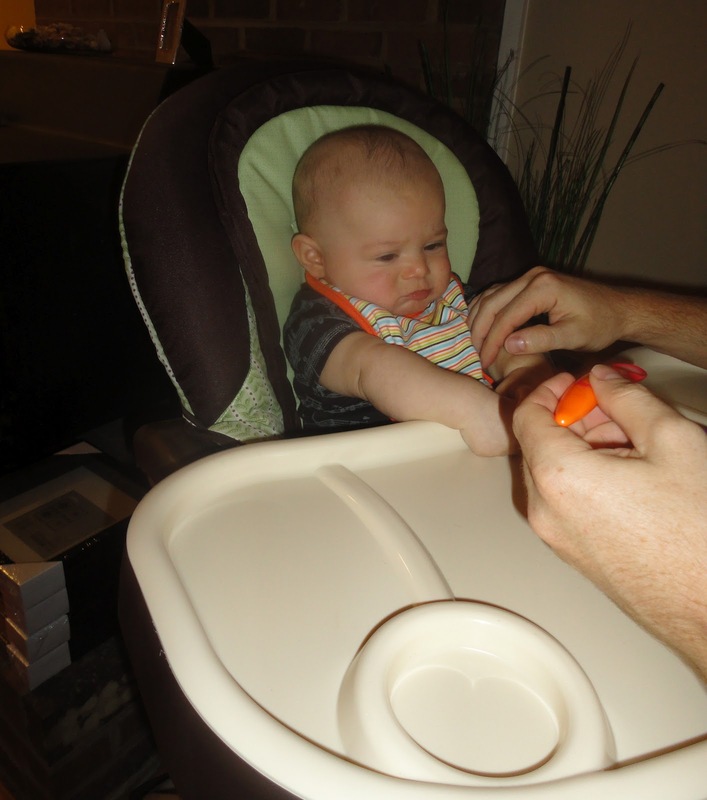 What do you do when you're not feeling 100% and your 4 month old monster is being fussy? You strap him into his carseat and take him for a long walk in the BOB. First stop was CVS for some "on sale" Gatorade. Next stop was Starbucks for an iced coffee since a certain monster woke up at 6:15am and my "one cup of coffee a day" wasn't cutting it. yesterday was a good day. I had Dunkin Donuts for breakfast (love their iced coffee), went on a long walk with some visiting family, Mason, Ryan, and Honey, ate at the Liberty and had their amazing burger, and then went for a run at the YMCA. The only problem with this was that I didn't wait enough time in between eating my burger and running. 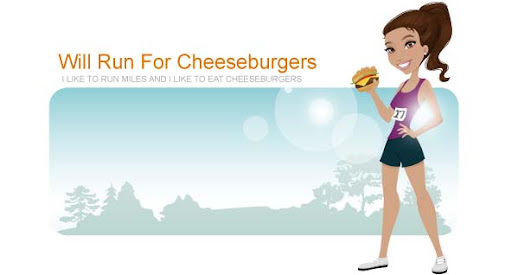 I spent the first mile of the run burping up cheeseburger and wishing I wasn't running at all. "Do I just stop my run now and go home?" "Should I just slow down my pace and get some miles in?" "Should I speed up my pace so that the run is over faster?" 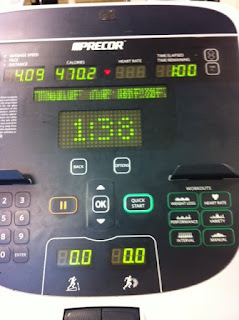 I finally talked myself into running the 4 miles I set out to do and am glad I did. I felt so much better afterwards and even rewarded myself with a beer from Salud Beer Shop (in NoDa). 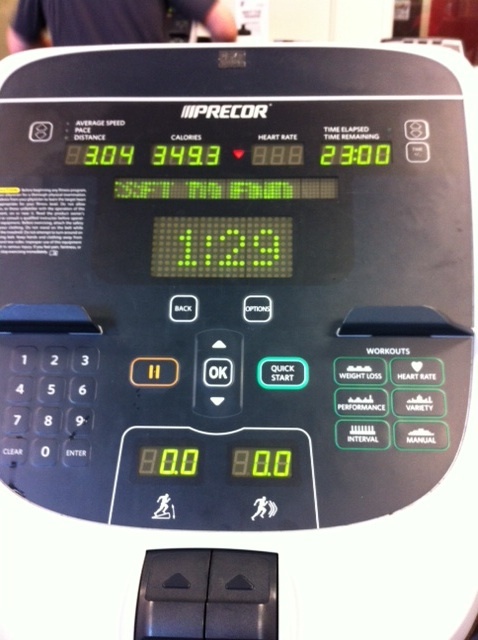 today was the 3rd day of running on a treadmill at the YMCA this week. 90+ degrees is just too hot for me to run outside. hopefully it'll cool down in the next couple of weeks so I can continue (or start?) my half marathon training outside. I went into today's run with the phrase "slow and steady" in my head. I didn't want any speed during my run since I haven't run 5 miles since half marathon training LAST YEAR. This was definitely the longest run I've done since the Rock n Roll half marathon in Savannah last November. Anyways ... after a really long day of dealing with my lovely almost 4 month old son (he was extra fussy due to a round of shots at the doctor's office) I finally made it to the YMCA a little after 5pm. I guess most people were already off enjoying their weekend because the gym was E-M-P-T-Y. I hate that the treadmill resets after 30 minutes with a 5 minute cool down. I stopped after hitting 32 minutes originally thinking that I would have done 4 miles exactly, keeping up with an 8 minute/mile pace. 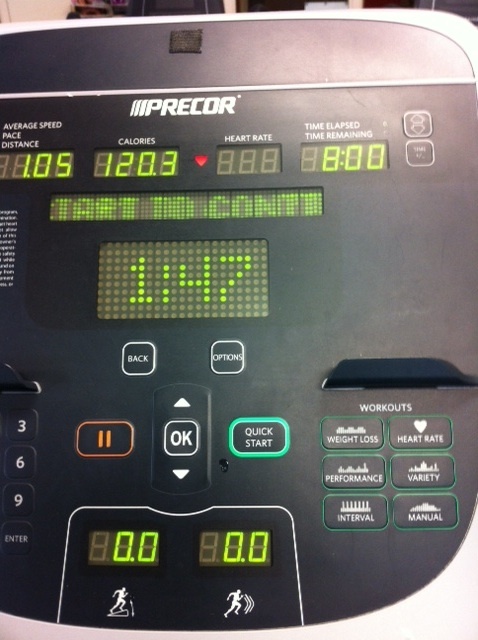 I surprised myself with running sub 8 minute miles the entire time. Which is awesome! Next week's long run will be 5.5 miles, with the following week (technically first week of training) having 6 miles as the long run. We'll see how this goes! Mileage so far this week (not counting Sunday) is roughly 11 miles. While my parents were in town a couple of weeks ago, I planted a small garden in our backyard. One of the plants was a small basil plant. 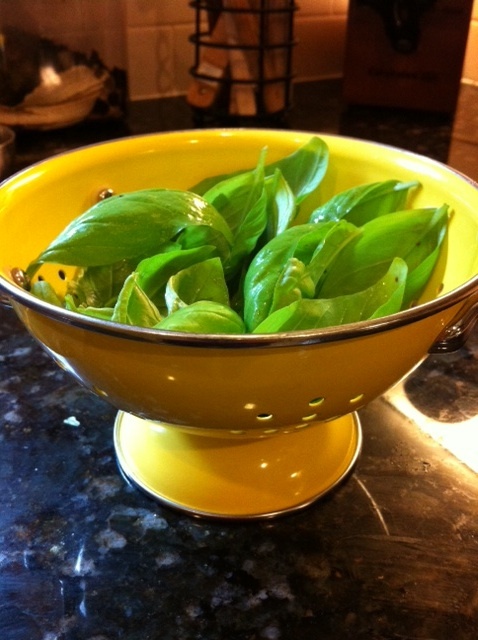 Fortunately my non-green thumb has not killed it and I was able to pick some basil today. 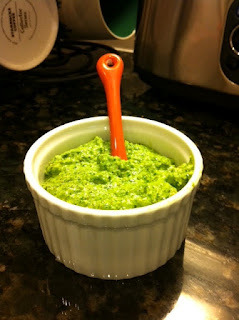 I used the fresh basil, along with some organic baby spinach, walnuts, olive oil, garlic, and salt, to make pesto. I made the pesto to use as the base for homemade pizza. 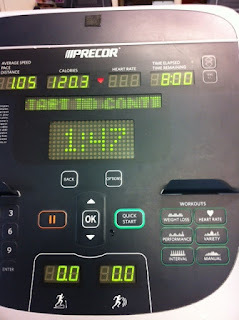 Before I made the pizza, though, I headed to the YMCA for some treadmill time. 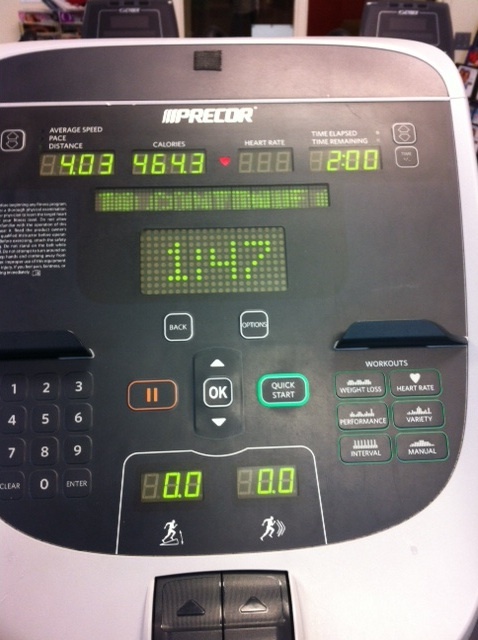 I tried to run faster than yesterday and succeeded! 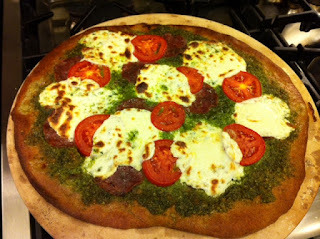 Once home and showered it was time to start working on my basil pesto pizza. I used the pesto as the base of the whole wheat pizza and then layered slices of roma tomatoes, fresh mozzarella, and dry salami. 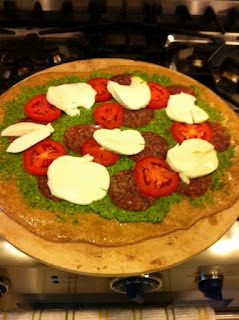 The final product was cheesy and delicious! Even Ryan liked the pesto :) Mission accomplished! this morning Ryan, Mason, and I completed a family run along the Greenway (one of my favorite places to run in Charlotte). It was already hot and muggy by the time we got out there at 8:30 am. I pushed the BOB for the first 1.5 miles and Ryan took over for the 2nd 1.5 miles. We finished 3 miles in 27:05 minutes, doing negative splits along the way for each mile. After our run we headed to the Original Pancake House for some breakfast. I would've had a picture of my delicious pancake breakfast but I ate it too fast. Instead here is a picture of Mason looking super thrilled to be at the restaurant with 2 stinky and sweaty people. This week I managed to run 9 miles during 3 different attempts ... hopefully I can add another 6 miles to that in order for next week's total to be 15.
yesterday I got back to the YMCA for a run on the treadmill. after having 3 days off I was worried that I wouldn't be able to successfully complete what I consider to be a decent run. I surprised myself and ran 4 miles. Once I got home I worked on making some delicious Chinese "take out." I used the recipe for CRAB RANGOON off the Nasoya website and baked them instead of frying. I also made some FRIED RICE using an egg, green onions, soy sauce, and brown rice. I added some Sriracha sauce upon serving for some spice. 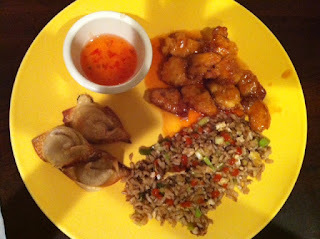 The main star of the meal was SWEET AND SOUR CHICKEN, using a recipe from the blog, Life as a Lofthouse. The meal was delicious and a great alternative to ordering Chinese food from a local restaurant. sometimes I'm convinced I'm lactose intolerant. it's during those times that I switch most of my dairy products to soy based. 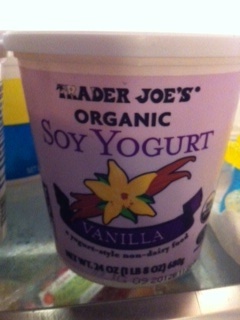 during my last visit to Trader Joe's I picked up a container of their "organic vanilla soy yogurt." I decided to throw some of this into my smoothie and try it out. 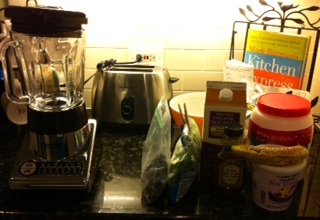 Final product was a delicious, thick and creamy green monster (slightly brown due to the addition of blackberries). 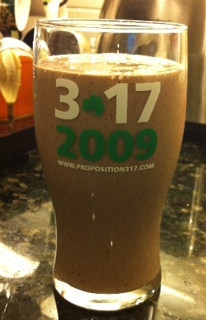 Since I don't see lunch on the horizon any time soon I'm looking for this smoothie to fill me up for a couple of hours. one of the many things that I've learned since having Mason is that sometimes planning and scheduling goes awry. he's also showed me that you can never have too many bibs or burp clothes lying around ... but that's another post. I really want to run the half marathon on September 23rd. Like really really want to. I think training for it will keep me motivated to work out. I would also love to see how I do 6 months after having a baby. I have no doubt in my mind that if push came to shove I could run 13.1 miles in 8.5 weeks. It might not be pretty, and there would probably be some walking breaks, but I know I could finish. anyways ... I had every intention of running today. I was going to strap Mason into the BOB and knock out a couple of miles before it got to warm out. Then he practically threw up all of his food onto me. Normally I wouldn't be fazed by this but he's done this almost every day for the past week, during almost every feeding. Plus he keeps making this sad coughing, "I think I'm going to choke," sound. I really need to STOP googling every little symptom but from what I've gathered this might just be reflux. Or he could possibly be sick. Instead of dragging my poor son outside for 20 minutes in 80+ degrees and super humid conditions, I think I'll pass on the running today and just let him rest. Which in turn means I get another rest day (yesterday we didn't run either). 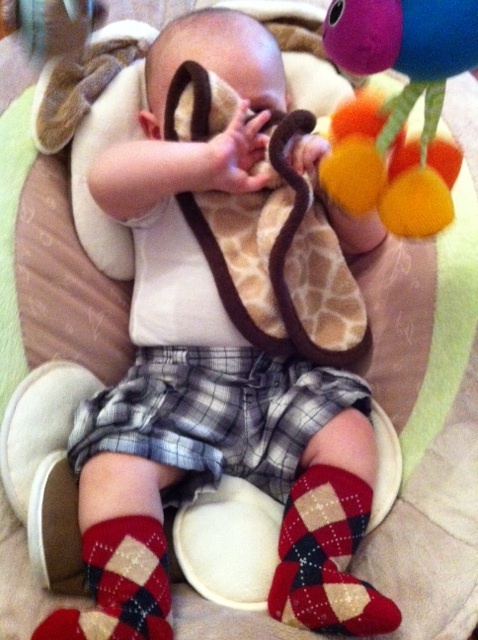 and yes I dress Mason in ridiculous combinations sometimes. 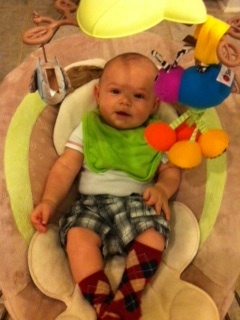 it's not like we're going out in public so black plaid cargo shorts and red argyle socks seem appropriate. back to the half marathon and my thoughts on training. ideally I would have 12 solid weeks of training before the race. at this point I'll take what I can get, which is why I found this 8 week training plan. My immediate thoughts are to do my long runs on Saturday (which is what I'm used to) instead of Sunday. During training for my last 2 half marathons I never reached the recommended long run distance prior to the race. I know if I can train up to 9 or 10 miles, I'll be able to knock the rest out on race day. 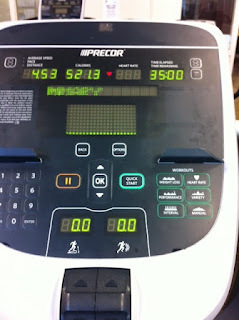 This Saturday I'm going to attempt to do 4 or 5 miles on the treadmill to (once again) ease back into it. With the above training plan I know I don't technically have to start training until the week of August 6th. That's based on the assumption I've been running at least 15 miles a week ... which I haven't been. The next 2 weeks will be all about getting my weekly mileage back up to that point. Unfortunately most of my runs will have to take place indoors at the YMCA on a treadmill if the weather doesn't start cooperating. I'm OVER this heat wave ... I guess it's safe to say that it's not just heat wave, but what most consider the season of SUMMER.